I have wanted to write about this since the Oct 28 "release" by NOAA, said release being stinkier than GHG Methane, LOL. I bought a largely expanded greenhouse this fall, being ready for also a colder, longer winter, and maybe a cooler summer. If you don't understand how "Quiet Sun" (meaning sunspots, not energy output) affects the climate, you need to do a search or 3 at Nukepro. I also came up with the Galactic Cosmic Ray hypothesis for Magmatic gas "nucleation". The data fit, the exact causative methods are still under investigation by the engineering team at Nukepro. LOL consisting of exactly 1 engineer. correlated a strangely placed Hawaii earthquake, just 2 minutes after a big quake in Indonesia. Nothing "travels" that fast in terms of mechanical pulses, vibrations, movements, regardless of frequency or density of medium. Epiphany....acting mechanism must be electric, magnetic, and possibly gravitational "waves". Maybe even the "Grand Unification" unknown primal force that is lurking right beneath our noses. Hiding in plain sight methinks. ------------------------------------- But please, don't laugh with NOAA, laugh at them. 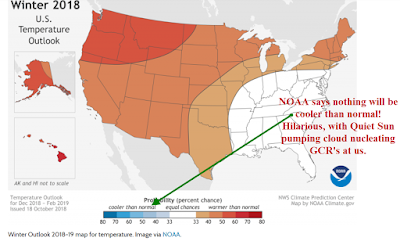 NOAA says nothing will be cooler than normal! Hilarious, with Quiet Sun pumping cloud nucleating GCR's at us. I am concluding NOAA can "predict" weather these days because they are the ones making the weather.